Clear Cyclical Slowing Continues in EMU and Beyond; What Does It Mean? The EMU manufacturing PMI sketches out a path that is a clear reminder of that old economic adage ‘what goes up must come down.’ It is not clear how long this downshifting will continue or where it will stop. Manufacturing is still in the process of unwinding its past gain. Trade conflicts also add to pressures on manufacturers and since China is a big part of the trade slowing its effects can be large and spread through weaker import demand even to those that are not directly linked to the trade restrictions. And that, of course, impacts manufacturing first and most clearly. There are also signs of encroaching weakness across this group of large EMU members. Last year the EMU was sporting some consistently very strong readings. But as of September, the EMU total and manufacturing PMIs are steadily eroding from 12-months to six-months to three-months and the current values are below their respective three-month averages as well. Even the services sector that has been steadier has a September value that is below its 12-month average. Among its four largest members, all but France show signs of wear and tear. The EMU has German manufacturing with a 49th percentile queue ranking, below its five-year median. Italy’s composite PMI standing is only in its 28th percentile, kicked to the curb by its manufacturing gauge that is in its 11th percentile. The Italian economy has not been able to claw its GDP back to its pre-crisis level. The economy is performing badly. The new government is trying to use some fiscal stimulus to right Italy’s sinking economic ship that is taking on water as these data show. Yet, all the EU Commission can do is to sit back and dictate that Italy after 10 years of continuous pain must continue to obey the specifications of Maastricht (better known in Italy as Mass-Trick). With ‘wisdom’ like that at the EU Commission, is there any wonder that Europe is in such a mess or dealing in such a brusque way with the U.K. over Brexit? Spain, the fourth largest economy in the EMU, has spent time under EU-mandated austerity programs as well. 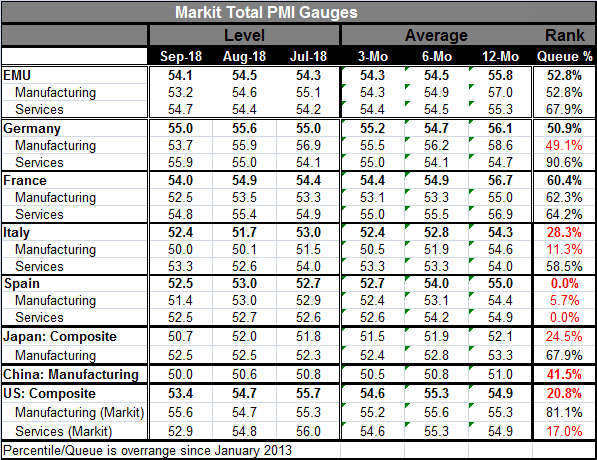 Its PMI gauge is at its lowest mark of the last five years. Its services sector is also at its lowest standing. Manufacturing in Spain is at a 5.7 percentile standing – extremely weak. Among the four largest EMU economics, only France does not have at least one sector below its five-year median. But France’s overall and sector rankings stand in the low 60th percentile decile. France is only saved from much worse standings because it had seen such weakness earlier, not because it is doing so well now. Outside of the EMU, we see Japan’s composite PMI ranking is below its five-year median with a very weak 24th percentile standing. China’s manufacturing gauge has a 41st percentile standing, also well below its median. Even the U.S. on this gauge has a weak 17th percentile standing. But the U.S. has a much stronger standing for its services-plus sector in its ISM survey for nonmanufacturing. That is the oldest PMI gauge for services in the U.S. and in the U.S. the Markit surveys generally are dismissed. This month the U.S. ISM nonmanufacturing and the Markit services gauge are like signals from different planets. This same boom/bust type pattern can be seen in both the developing country indexes as well as the developed country groups. The cyclical behavior is more pronounced for the developed country group. The developing group has lower readings throughout and is now closing in on a value of 50 indicating that output is slowing and nearly at a standstill there. These are not good developments. If markets are reacting to developed economy central banks hiking interest rates, maybe these charts go a long way to explaining why those markets are performing so badly. If the developed economies slow their expansions at a time when developing economy manufacturing sectors are barely generating any growth, the knock-on effects to the developing economy could be severe. Interestingly, amid all this slowing and all these sub 50th percentile readings, in the U.S. Fed Chair Jerome Powell this week spoke of how bright the outlook is for the U.S. economy. And, he has noted, what an ‘historically rare’ era in history this is. Will those turn out to be ‘famous last words’ on the subject from Mr. Powell? The U.S. unlike many other countries is riding a new wave of demand that was started by the need to rebuild after hurricane damage and then piggy-backed on top of a tax cut and fiscal stimulus. Growth in the U.S. has been aided by this fiscal jolt as well as by firm international conditions. Competition from abroad has probably had more to do with keeping inflation in the U.S. low than Federal Reserve policy. But now while the U.S. domestic dynamics are looking ‘so good,’ the international dynamics are looking much worse. If the international economy slows, it will put more downward pressure on prices in the U.S. and the Fed’s current proximity to its inflation targets will become short-lived. Prices will weaken and the U.S. will have an inflation short-fall again. So which is it? Where are the real risks? Are the risks, as the central banks in our money center countries think, in the direction of overheating? Has easy-money overstayed its welcome in the U.S., EMU, U.K., and Japan? Or despite the long period of historically low rates, is the global economy still floundering and are rate hikes more likely to destabilize what is an ongoing but less than robust recovery? Is there something about the structure of trade that has failed to spread the benefits of Free Trade – since it obviously has not be a system based on real free trade. And if the answer is that despite global slowing the money center countries need to lift rates, the question then turns to what stimulus there may be to replace what is being lost by running a tighter monetary policy? The Federal Reserve is apparently preparing for the next recession, expecting it to be a lot like the last one. But what if it turns out to be another garden variety recession, based on the collapse of demand, that is triggered by rising rates even if the trigger is a rate level that is historically low. What then?